Located at the beach near the airport at the roundabout. 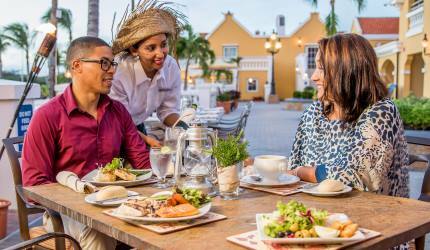 Owner Gerco (chef) and Luc (Maitre d') have created a unique dining experience where you can enjoy the best Aruba has to offer: a great view of the ocean and sunset, experienced and friendly staff and high quality food. Ideal for special occasions or just a wonderful night out! Barefoot has always been the place to end the day. The food, staff and setting are wonderful. We would recommend Barefoot to everyone for the beautiful sunset memory. The name of the restaurant doesn't fit the place. My daughter and I were wearing flip flops and a simple dress. We were told there was no beach seating available. We were seated way in the back were the parents with kids were seated. Btw- when we were leaving, half of the beach seating was not used and unoccupied. Obviously we were too casually dressed to be shown off in front of the place. The food was not anything special. There seemed a lot of confusion going on. I would never go here again. The ambiance is way too fake. 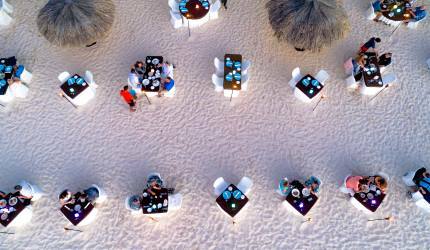 Top in our Aruba list, and there are many great places to eat. 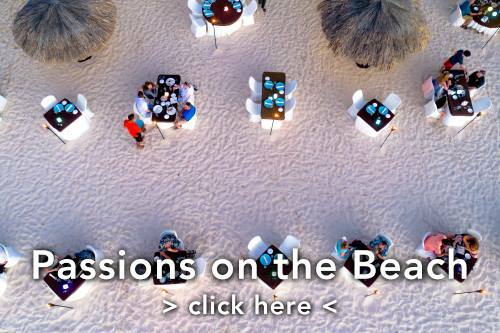 The combination o food, service and beach ambience is hard to beat. We were extremely happy with every phase of the dinner we had on Mothers day. There was not a complaint about anything that the four of us had. Plus add in the sunset & things could not have been better! Barefoot was a rare gem - awesome food, great service, incredible ambiance. 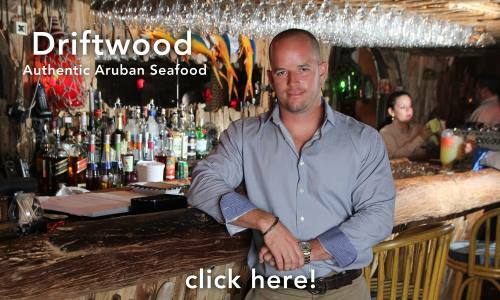 I was looking for high end Aruban food with incredible atmosphere. After reviewing many reviews on this site and others, Barefoot looked like it fit the bill. Boy was I surprised. It exceed my expectations on every level. The hostess accommodated us as a walk-in despite a very busy evening. The service was so attentive all the way through. The food was a big notch above most other Aruban nice restaurants, and the wine list was fantastic. 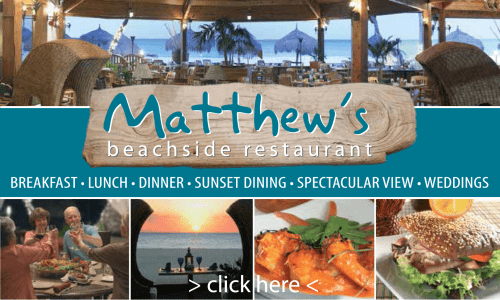 I travel all around the world and have dined at many of the best in the world - in Aruba, this one tops the list. We have been coming to BAREFOOT ever since it opened its doors and were one of its first customers. We have always been happy here and have never been disappointed. This year, something seemed to have changed. It is hard to say exactly what but it was a noticeable difference. It almost seemed as if the emphasis this year was on the volume rather than the quality of service. Both the food and the service were off a bit from the standards that had been in the past and which we had come to expect of the place. We sincerely hope that this is not a trend for this place. Food and service, nonetheless, remain quite good and we would encourage continued patronage until such time as and if matters continue to deteriorate (which we hope will not be the case). We have downgraded the place and may take a year off from it to give it the opportunity to deal with whatever is going on - we are hopeful that they will successfully address the issues. As an aside, we had a pleasant walk from downtown Oranjestad to Barefoot along the walkway that had been installed and were pleased to see the development in the area of Barefoot as well. We hope that will carry over to and bode well for the restaurant also. On March 1, we returned to Barefoot as we had loved it on previous occasions. I had the Romance of the Sea and although the fish was good, the sauce had absolutely no flavor. It was as if it was just a roux. There was about one tablespoon of mashed potato. We had so looked forward to our visit, but were quite disappointed in the food. The dessert was very good. We dined at Barefoot 5 times recently including Valentines Day. I can't say enough about the weekly specials. Seeing Luc and Claudia always adds to the visit. 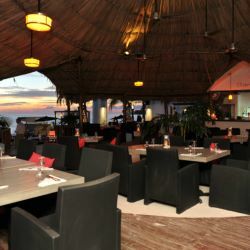 Wish I could dine there every Friday! Barefoot restaurant is officially my favorite restaurant of this aruba trip. We ate their twice on our vacation and each time it was absolutely incredible. I had the grouper both times, the first time it was the special of the week, the second was the Italian style with pasta, the grouper is crusted in cheese and is flaky and tender and the sauce has capers and olives and tomatoes in it. The portion is perfect. The chocolate brownie is out of this world. I am not much of a drinker but they have the best wine spritzer I have had at any restaurant. The atmosphere is peaceful, boats parked in the water, a cruise ship lit up slowly driving by and all under the stars. The service is incredible. Whoever the manager is is doing a great job as the staff really move and are super attentive. A must try! Always tough to decide where to eat, but so glad we went! The staff is excellent...on top of things and so pleasant. The wine list is really varied and the food was exceptional. Grouper so fresh it was practically still flopping around...mom had tender beef tips in perhaps one of the most delicious sauces I've ever had. And because it was her bday we were greeted with complimentary glasses of champagne upon arrival. Don't miss this place!